The tidal streams in the approaches to Cowes and within the River Medina are considerable. During spring tides, the rates off Prince Consort buoy can approach 4 knots immediately after High Water (HW) Portsmouth, as can rates in the vicinity of the Cowes Chain Ferry during ebb tides. Height of tide is also significant when navigating in Cowes Harbour. Even for craft drawing as little as 1.5m, care has to be taken when navigating in the River Medina above Kingston Power Station with the depth in the fairway up to the Folly Inn as little as 0.7m below Chart Datum. Passage to Newport, 2 nautical miles south of the Folly, can generally only take place about 2 hours either side of high tide. 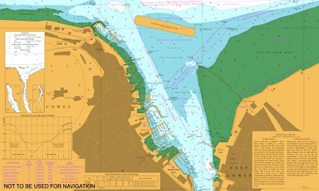 Craft using the Cowes Eastern Channel, when arriving or departing Cowes Harbour from/to the north or east, can do so at most states of the tide as it is dredged to 2.25m below Chart Datum (check that your draft is less than tide height + 2.25m). 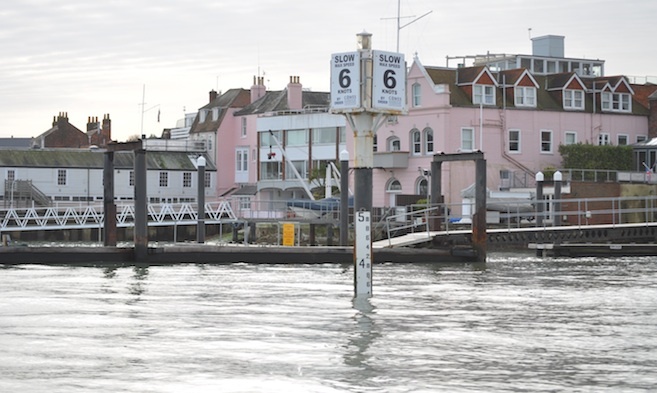 Tide gauges are in place on the Shrape Beacon, at Watch House Slip by the Island Sailing Club (see photo above), at Cowes Town Quay, the 4A beacon at the west end of the Eastern Channel, and at the north end of Medina Wharf opposite East Cowes Marina. Vessels approaching Cowes from the west should note that slack water off Egypt Point takes place approximately 3 hours before High Water Portsmouth. Tidal flows in the deeper water in the Solent can be considerably stronger than in the approaches to Cowes and may even run in the opposite direction to that between Nos 1 and 2 buoys, therefore approach with caution and look for the tidal flow on the buoys. Typical cross currents HW -2hrs at MHWS. Just off of No 1 and 2 buoys a westerly going ebb tide runs between High Water -2.5hrs and HW +3hrs with maximum rates around 1 hour after HW; the rate may be as much as 2.5 knots on spring tides. The easterly going flood tide generally runs from HW+5hrs to HW-3hrs and is weaker with rates of up to 1.5knots on spring tides. When passing west of the new Cowes Breakwater and up to the red No 2A buoy you will enter a tidal shadow with little movement, however an outgoing northwesterly flow may be experienced on the west side of the fairway off Trinity Landing and the Royal Yacht Squadron from HW -3hrs. 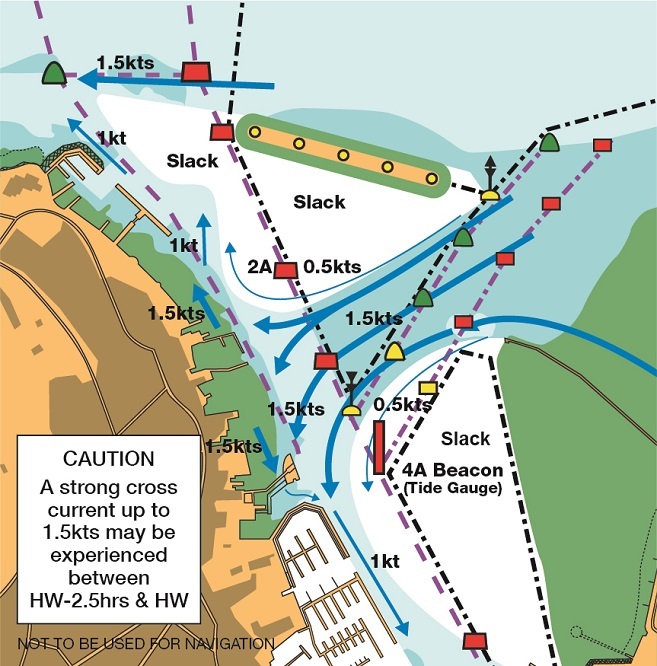 In the Inner Fairway, between the Island Sailing Club and the Eastern Channel between HW-2.5hrs and HW -1hr vessels will experience a westerly setting cross current of up to 1.5knots which will have a tendency to set vessels down towards the western shore. This cross current splits into two separate flows on the western side of the fairway in between the Island Sailing Club and the Red Jet terminal with a current of up to 1.5 knots running along the foreshore in either direction. See diagram in Local Notice to Mariners: Change to Tidal Flows in Cowes Harbour. Large vessels, including the Red Jets and vehicle ferries, when entering or leaving the harbour during this period may be required to remain on the east side (red buoys) of the fairway between No 2A buoy and the Eastern Channel beacon to avoid being set down onto the western shore. Small craft should be prepared to alter their heading so as not to be set across the fairway when transiting this area and avoid impeding the safe passage of commercial shipping and ferries. The flood tide in the vicinity of the Chain Ferry runs up to 2.5 knots between HW-2.5hrs and HW on spring tides. From HW to HW+2hrs the tide generally stands south of the Eastern Channel beacon before the north going ebb tide starts to run, this is generally weak to start with, running at its strongest between LW-3hrs and Low Water. In the vicinity of the Chain Ferry this ebb tide can run up to 4knots on the large spring tides and up to 2.5knots in the main harbour flowing out into the Solent between both entrances. 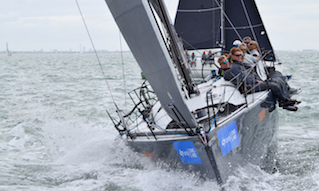 Vessels using GPS to measure their boat speed must be aware of the effect the tidal stream has on their speed over the ground and ensure that the Cowes Harbour speed limit of 6 knots through the water is not exceeded. Harbour users are advised to familiarise themselves with the contents of Local Notice to Mariners: Change to Tidal Flows in Cowes Harbour.